The Galway Tent Blog: EU Wonders Were Poolbeg Incinerator Hearings a Sham? EU Wonders Were Poolbeg Incinerator Hearings a Sham? The Green-FF government does not care the Poolbeg Incinerator hearings were a political sham - they themselves and their €200,000 pensions come first. To divert the public during the elections perhaps it'd be a great idea to issue a report on 60 years of child abuse wherein the judiciary allegedly frustrated police investigations and the Pope threatened President Bertie (Parish of Boston-not-Berlin, says hello). Guess why Ireland is ranked worse than China and Ghana for legal corruption by the World Bank. Is Poolbeg a good location to research legal corruption? 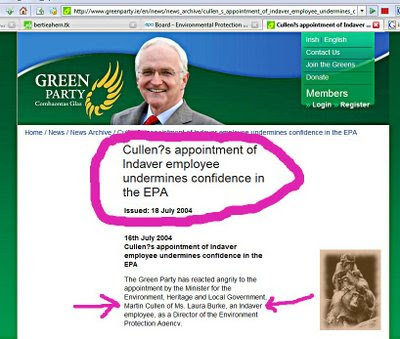 The Poolbeg Incinerator Hearings at Board Pleanala and at EPA-Ireland were apparently decided by unseen politicians above the heads of the professionals in those organisations. The boards appear to be loaded with either incinerator-industry-insiders or political-crony appointees. A fewyears ago John Gormley condemned EPA's director but now he's in charge he has done nothing about her. Good science and the public good appear to have been ignored by the bosses of the regulators. Political cronyism at the banks, the alleged financial regulators and the building-industry have near-bankrupted the economy. Political cronyism operating on or in the other alleged regulators, EPA and Bord Pleanala, combined with an offshore-based waste-to-toxins incineration industry may shorten lives by up to two years across Dublin. With elections coming up Green-FF is spinning that the offshore operators have no money. Covanta-Poolbeg is based in Luxembourg. There are lots of offshored-banks in Luxembourg, almost nothing else. And Covanta has lots of money. It’s the latest in a saga of legal controversy dogging the planned €266 thermal treatment facility, which has nonetheless managed to secure a licence to burn 600,000 tonnes of household waste a year. But this international case could be particularly embarrassing for Environment Minister John Gormley, who has previously been vocal in his opposition to Poolbeg. The Minister has come under fire from Dublin MEP Proinsias De Rossa for failing to respond to the EU’s written warning earlier. ‘This is yet another unnecessary, costly legal battle; it’s a sad state of affairs that Europe should have to take legal action against a Green Party Minister to ensure that all the implications of incineration are considered,’ he said. Green-FF Incinerator Cuts Pension Costs. NAMA To Rescue Uneconomic Incinerator? Green-FF Desperate Untruths on Incinerator? DDDA's Cynical Usage of Social Housing?